Today I am finally starting the good copy of my vegetable painting assignment. I have been studying squash as you can see. 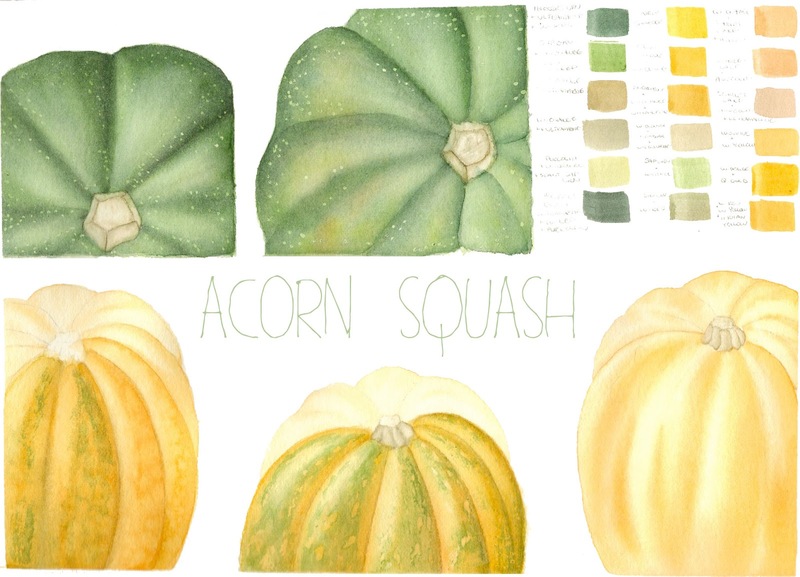 In botanical art you always use live subjects rather than working from pictures, so it is nice that the squash keep for such a long time compared to flowers. I am progressing with the techniques though I still need to improve a little on the texturing. I need to find a way to make the dots on the green squash a little smaller. For those that do not know, watercolour is a translucent medium unlike acrylics. So you cannot just paint tiny light green dots over a dark green surface. Instead you must apply masking fluid which reserves the previous colour (in this case light green) and then I paint over it all with dark green. Once the painting is dry I remove them and there they are, light green dots. However I need to achieve a finer spray of dots than what I have now. Even though I have been using a toothpick and a pin to apply the masking fluid it is hard to get consistent tiny little dots. Oh well, where there is a will there is a way.I hope to finish my good copy next week so I can mail it off to my tutor in the UK. Back to painting I go. My next assignment involves the dissection of a singular species of flowering plant. I am trying to think of what might be a good plant to choose. What type of plant would you like to see dissected and painted?